If you haven’t noticed, the Olympics are on! London being six hours ahead combined with the Internet being the Internet means that I’ve had almost every swimming event spoiled ahead of time, but it’s still fun to watch the races. Sometimes miss those multi-day swim meets. There’s something about sitting around a gym waiting for your race with a bunch of other chlorine-laden people that fosters camaraderie. In 2003, at the age of 15, Vollmer was training for a chance at the 2004 Olympics in Athens. She battled dizzy spells and light-headedness. In addition, her heart rate was abnormally high and would be very slow to return to normal after her training sessions. Her parents took her to see a doctor, then a cardiologist, and Vollmer was diagnosed with a heart condition called supraventricular tachycardia. Without getting into too much medical vernacular, this caused Vollmer’s rapid heart rate. At the age of 15, Vollmer underwent heart surgery. Rather than undergo more surgery, she elected instead to have an external defibrillator available during training sessions in case of an emergency. She went on to win a gold medal in the 4×200 freestyle relay at the 2004 games, but failed to qualify for the Beijing Olympics in 2008. Here she is in 2012 back with a vengeance swimming butterfly like no woman ever has. What a champion! So it’s only appropriate that Neen’s Notes shares its own favorite little gold medals this week, and that means buttery, nutty blondies. A good friend (also an excellent photographer whose work you can find here) brought me roasted, salted macadamia nuts back from her recent honeymoon trip to Hawaii and I’ve been putting them in everything. Pretty sure Joe is glad that I’ve now gone through the whole bag because he’s so tired of hearing “Oh my god these are the best thing EVER.” I even stowed a few in my pocket for Sunday’s 5.5 mile Reagan airport-and-back run. I love any baking recipe that makes very few dishes to wash, so I’ve now made these three times. 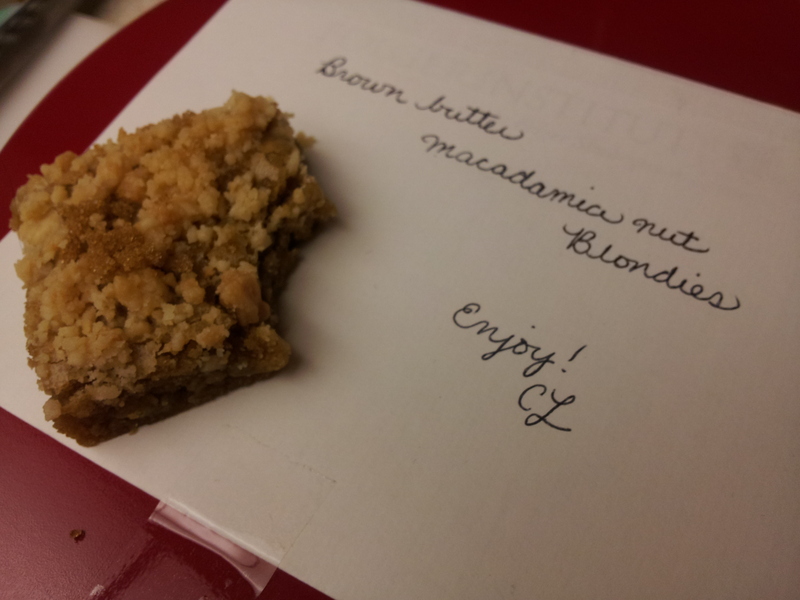 Lest you think I am gluttonous, the latter two batches were donated to coffee time at work. Line an 8 in. square pan with parchment paper or buttered foil. Parchment works a lot better for these, so if you have it use it. Grind the macadamia nuts in a food processor until they resemble a coarse meal. They’ll stick together a little bit, but don’t process them all the way to a paste. Melt the butter in a large saucepan over medium heat. Once it begins to foam, swirl the pan every so often and cook just until it begins to brown. Remove the pot from the heat. Add the brown sugar to the butter and whisk until thoroughly combined. Resist pouring this directly from the pot into your mouth. Mix in the egg and extract/flavoring until smooth, and then stir in the flour just until no dry spots remain. Fold in 2/3 of the macadamia nuts. Spread the batter evenly into the prepared pan, top with the remaining nuts, and bake for 25 minutes. The top will look shiny and the edges will be lightly golden. These are fudgier and less cake-y, so don’t be afraid of under baking them too much. 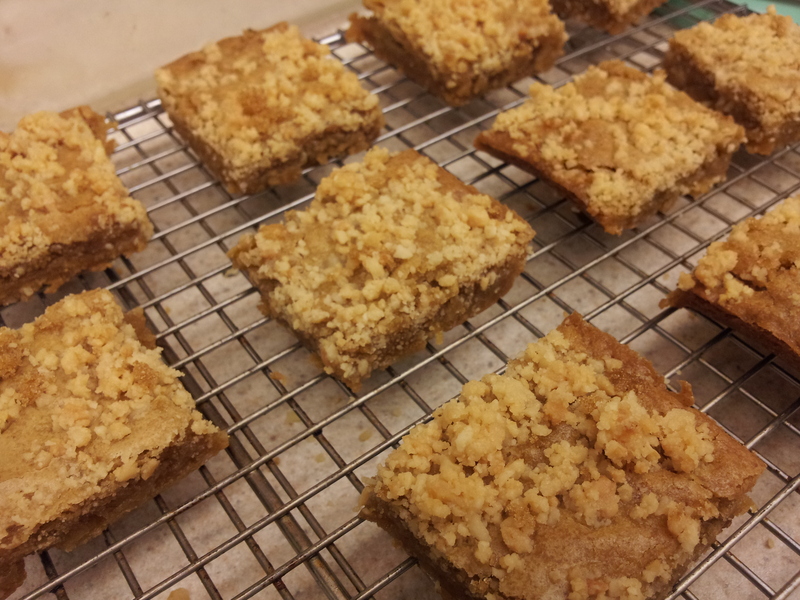 Extremely difficult part: Let the blondies cool in the pan on a wire rack for one hour. Using the parchment paper, gently lift them out of the pan and cool for another 15 minutes before cutting into squares. I’ve found that a long knife with a scalloped edge or a very sharp chef’s knife does the best job. Now you can enjoy your very own gold medals, and while not as shiny, I can almost guarantee that they will be much tastier than the ones Olympians receive.